Judith Ann Haugerud was born in Menomonie, Aug. 7, 1946, the daughter of Alvin and Rozella (Schill) Olson. Judy was baptized and confirmed at St. Joseph’s Catholic Church. Judy attended high school in Menomonie and graduated with the class of 1964. After high school she attended Eau Claire Beauty School. After receiving her beautician’s license, she moved to Amery, Wis., where she worked at Cory’s Beauty Salon. 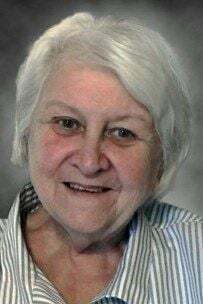 Judy was united in marriage to Bob Haugerud and together they raised three children in Hudson, Wis. Judy worked at the telephone company for a short time before returning to her career as a beautician. She worked at Modern Beauty Shop and then took it over when the original owner retired. After that she moved on to The Stylist Shop, also in Hudson. Judy retired from her beautician career in the late 1990s, but continued to work at Kozy Korner in North Hudson, until 2004. Retirement allowed her to take care of two of her grandchildren. Throughout the years, Judy enjoyed bowling, golfing, reading, attending Badger football games near and far, experimenting with new recipes and everything Christmas. Her priority was her family. She knew how to have a good time and loved to celebrate with her friends and family. “Ma” or “Jude” as she was affectionately called, always made everyone feel welcome in her home. She had a sweet disposition and a gracious heart, helping out wherever she could, driving friends to appointments and going to people’s homes to do their hair when it became too difficult for them to leave their home. Judy will remain in the hearts of her children, Bob (Rose Burnham) Haugerud, Stacey (Travis) Vissers, Sara (Scott) Vipond; grandchildren, Erica (Nate) Spurrell, Bryan (Kiersten Severude) Haugerud, Kaitlynne (Kody Rosen) Haugerud, Natalie Haugerud, Aidan Vissers, Ava Grace Vissers, Luke Vipond, and Isabel Vipond; great-grandchildren, Ethan, Connor, Michael, Carter, Isabella, Elizabeth, Jonathan and Emma; siblings, Carol (Jim) Knops, David (Diane) Olson, Jim (Laurie) Olson; former husband, Robert Haugerud; parents-in-law, Perley and Viola Haugerud; siblings-in-law, Susan Andren, Jim (Faye) Haugerud, David (Sonia Krause) Haugerud, Tom Mitchell; as well as many nieces, nephews, other extended family and countless friends. She was preceded in death by her parents, Alvin and Rozella Olson; brother-in-law, Charles Haugerud; and sister-in-law, Carol Mitchell. A memorial service will be held at 11 a.m. Friday, Jan. 11, at Bethel Lutheran Church—Downtown Hudson. Visitation was held from 4 to p.m. Thursday, Jan. 10, at Bethel Lutheran Church, as well as one hour prior to the service. Interment will be held at Saint Joseph’s Cemetery in Menomonie. Judy’s family would like to extend their invitation to join them for lunch at The Village Inn of North Hudson after 3 p.m. Friday.